If your interior or exterior door has been kicked in or your door frame has cracked, here are a few tips on how to repair it. In extreme cases the door frame and the wood around the door knob can both be broken and cracked. Most of the time these repairs can be done with wood glue, wood filler, and a wood clamp. In extreme cases, the best way to fix both the door and the door jamb/frame is a repair kit or a reinforcement plate. A door jamb repair kit will usually consist of a heavy duty strike plate and a door jamb metal overlay to hide cracks and reinforce the frame. As we stated above, if the crack on the door frame is not extreme, you can repair this without a kit. A minor crack in the wood can be fixed by following the steps below. If the crack in the wood is caused by the door being kicked in, then this would be considered extreme and a repair kit may be needed. You can attempt to fix your door jamb by using the steps below. However the wood may be weakened and needs to be reinforced. You can attempt to repair the wood using wood filler. If glue and filler will not repair your door frame, continue reading below. The item needed to reinforce the door frame is a long piece of metal that covers the door frame where the area is damaged. This part comes in a kit and is marketed for door security. It is the best option for all purpose door frame repair and comes with multiple pieces to reinforce your broken door jamb/frame. The full name of this kit is the EZ Armor Ultimate Door Security Combo Set. To fix the damage around your door knob, you will need to repair the wood if possible and install a Metal Door Knob Reinforcer. Remove the metal door catch/strike and or dead bolt catch/strike. Scrape away any small chunks of wood that may be protruding from the door frame. Be sure your door can fully close. If not, remove any wood that is preventing the door from closing. Once you are sure your door can close, move to next step. Fully open the door to access the door frame. Apply wood glue and or wood filler into the crack/cracks making sure to get it as deep as possible. Once the crack is full of wood glue you will need to add multiple wood clamps to squeeze the crack shut. Leave the wood clamps in place for a few hours. Note: Your door will need to be open while the clamps are in place and the glue is drying. Once the glue is dry, remove the wood clamps. The crack should now be difficult to even see now. The wood will need to be sanded down and painted. Reinstall the door catch/strike and test door. Do you have experience repairing a broken door frame? 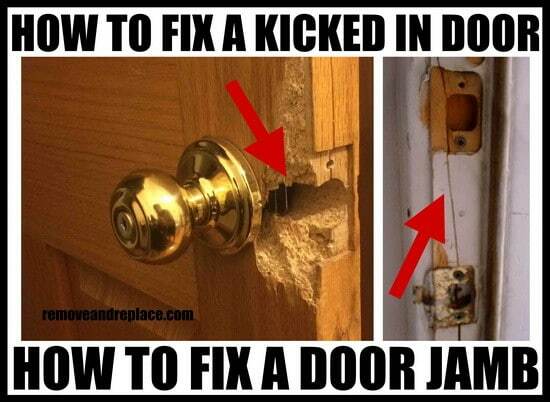 If you know a better way of fixing a cracked door jamb, please leave a comment below. I would think that DIY door repair would be easy. However, this repair seems like it is, at least, intermediate. I would not have known what you meant by, “Scrape away any small chunks of wood that may be protruding from the door frame,” so I am certainly glad for the visual reference. Next post: When Is The Best Time To Pin On Pinterest?